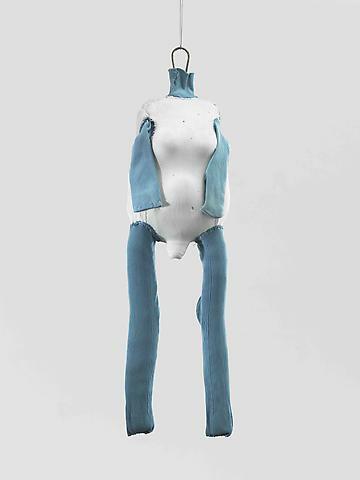 Cheim & Read is pleased to present an exhibition of hanging works by renowned French-American sculptor Louise Bourgeois (1911-2010). The exhibition will be accompanied by a full-color catalogue with a text by Robert Pincus-Witten. The sculptures in this exhibition all hang from the ceiling. Along with a group of drawings from the 1940s, in which pendulous forms are delineated in black ink, the selection of works traces the theme of suspension throughout Bourgeois’s long career. Spanning more than forty-five years – from the organic Lair forms of the early 1960s and the Janus series of 1968, to the cloth figures of the 1990s, the hanging heads of the 2000s, and the torqued spirals of shining aluminum made in the last years of Bourgeois’s life – they demonstrate the myriad ways in which she approached material, form, and scale. They also affirm the various readings of Bourgeois’s work, whether formal, psychological, biographical, or experiential. For Bourgeois, the sculptures’ suspension is an expression of the psyche; as she stated: “Horizontality is a desire to give up, to sleep. Verticality is an attempt to escape. Hanging and floating are states of ambivalence.” In psychology, ambivalence refers to conflicting but coexisting feelings for the same person, place, or event. The many dualities at play within Bourgeois’s oeuvre (organic/geometric; rigid/pliable; male/female) provide this condition with fertile ground. The very physicality of Bourgeois’s work – its density and weight – is offset by the seemingly effortless, floating state in which they are presented. Eschewing the traditional sculptural base, Bourgeois positions her work in dialogue with the viewer and surrounding environment. Tethered to the ceiling but by no means static, her sculptures have the potential to revolve on their axes, providing a sense of movement and instability. 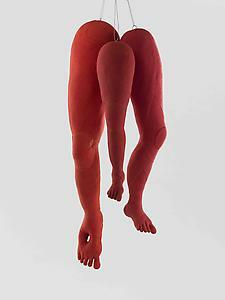 The implied vulnerability is especially profound in works like the polished bronze Arch of Hysteria (1993), in which a male figure hangs from a cord attached at the pelvis; the double-headed fabric Arch of Hysteria (2004), in which male and female torsos are fused and hung at the waist; or the bronze Femme (2005), which is suspended by the figure’s pregnant abdomen. Other works are similarly evocative. In Henriette (1985), a portrait of the artist’s sister, a single prosthetic leg never reaches solid ground, while the elongated rubber legs of Legs (1988) stop just shy of the floor. The soft folds and flaccid double ends of the androgynous Janus series (1968), though cast in bronze, seem exposed and defenseless. One – Hanging Janus with Jacket – seeks protection under a hard outer shell. The Quartered One (1964-65), conjures images of beef hanging in a slaughterhouse. Late works, like Untitled (2004) and The Couple (2007-09), manifest the implications of suspension within their forms – coils of aluminum weave in and out and over each other, as if echoing the spiraling and spinning of which they are capable. Various associations with hanging – suicide and murder, as well as the connection between mother and child through the umbilical cord – are further explored by Pincus-Witten as he examines the trajectory of Bourgeois’s work. The earliest piece in the show—an intimately-scaled bronze Lair, painted white and hung on a steel hook— is dated 1962, but Bourgeois’s writings and drawings attest to her preoccupation with the idea of suspension much earlier. In 1957, during the height of an intensive psychoanalysis that went on intermittently until the 1980s, she wrote: “loathing of the floor – wish to hang things / and see hanging things (drawings of / hanging sheathes whole series).” Bourgeois traced the origins of this impulse to her childhood. As she has described, her father stored his collection of wood chairs in the attic of the family home, hanging them from exposed beams: “It was very pure. …You would look up and see these armchairs hanging in very good order. The floor was bare. ...This is the origin of a lot of hanging pieces.” In a May 1996 diary entry, she writes: “Hanging things must be loved / green beans on the ceiling in Antony.” As with all of Bourgeois’s work, an underlying current of biography informs her process. But while the sculptures (and many of their elongated forms) can be traced back to visual and emotional recollections of her childhood, their physical presence is charged by the viewer’s individual reaction. Ultimately, it is this visceral exchange which Bourgeois sought to provide. All Louise Bourgeois quotes © The Easton Foundation.